Who you got for Spider-Man? Stephen or Kyrie? Have you ever wondered what LeBron James would look like commanding a Wakandan army? Stephen Curry slinging from building to building around downtown Oakland, California, or Maya Moore commanding the forces of weather to secure yet another WNBA championship? No? Well, we at The Undefeated have. 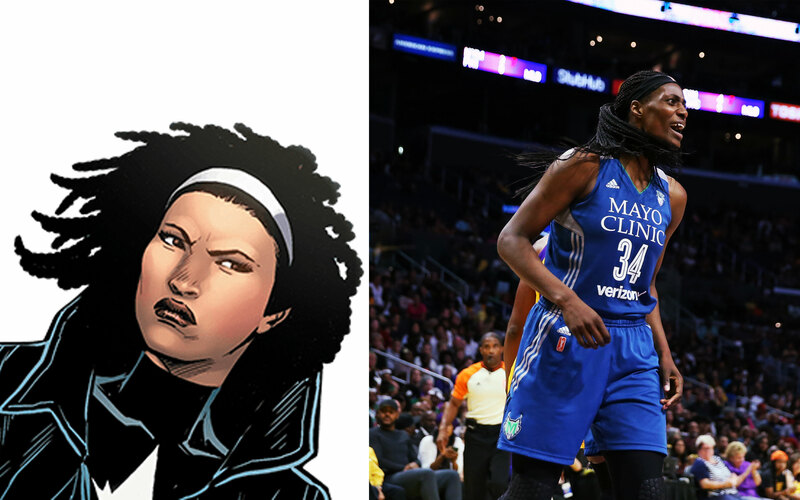 With the release of both Marvel’s Black Panther and The Undefeated’s “Black Super Hero” bracket this week, we took a collection of the greatest basketball players in the NBA and WNBA today and compared their strengths and superpowers (and many of these mere humans have superpowers) with the greatest black superheroes in the history of Marvel Comics. 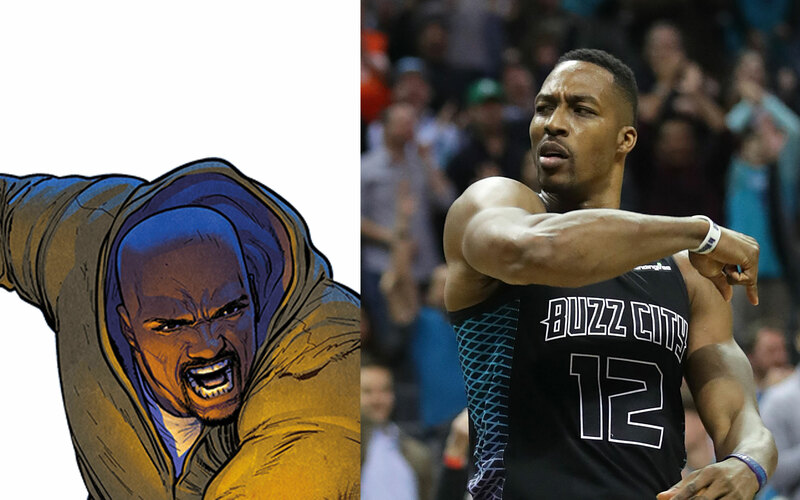 Some comparisons you may agree with — yes, Dwight Howard is corny like Luke Cage — while others may inspire great debate. This is simple. 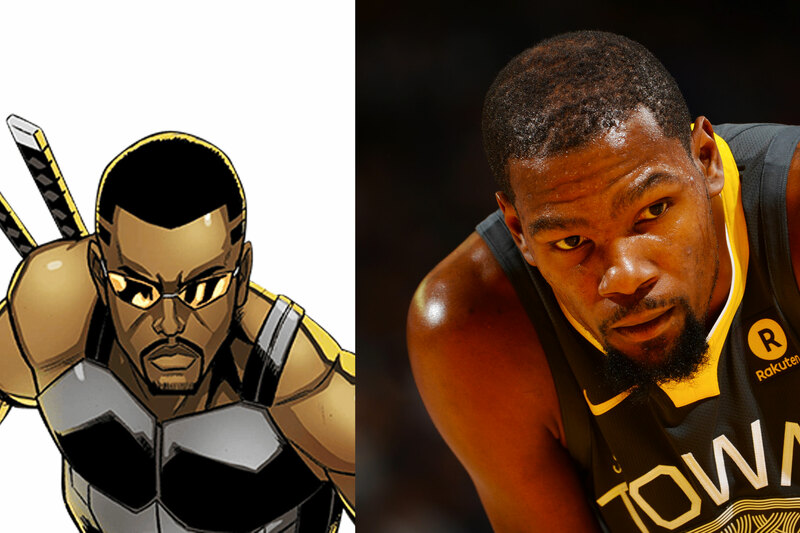 One man is the king of Wakanda, a fictional African country, and the other was dubbed “King James” when he was still a child. When it comes to education, the two are polar opposites: T’Challa, aka Black Panther, earned a doctorate in physics from Oxford, while James skipped college entirely to go straight to the NBA. But just as T’Challa, along with the likes of Tony Stark and Reed Richards, is considered one of the most intelligent members of Marvel Comics, James’ greatest weapon is his brain — he possesses one of the highest basketball IQs in all of the land. 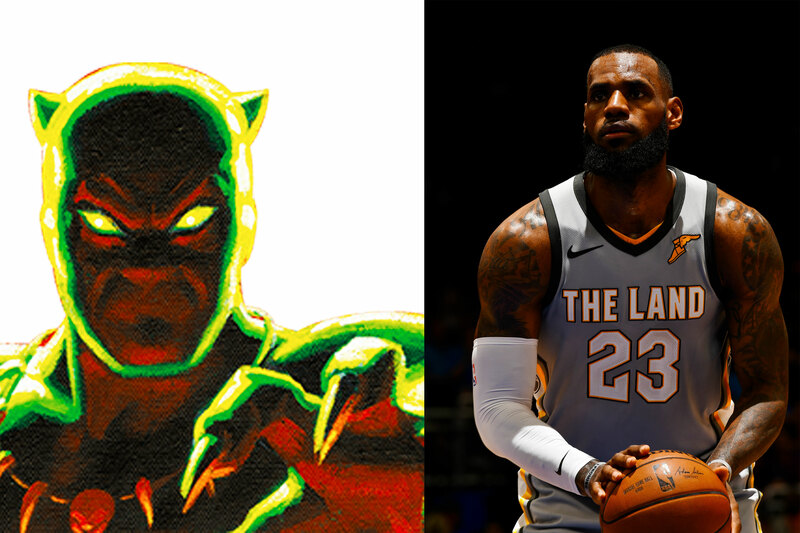 The pair also both know something about superteams: James joined two in Miami and Cleveland, much like Black Panther was a member of both the Avengers and the Fantastic Four. Black Panther also spent time in the Illuminati, which … yeah. Before Ororo Munroe, aka Storm, was a member of the X-Men and one of the most iconic female comic book characters, white or black, she was a master thief roaming the streets of Cairo. Moore, a guard for the Minnesota Lynx, also has a penchant for thievery: She hasn’t finished lower than sixth in steals per game since 2013. While not an African goddess like Storm, safeguarding the nations of Kenya and Wakanda, Moore has dedicated her life to social justice causes, fighting for criminal justice reform and prosecutorial misconduct and against police violence. Leadership is a shared trait among the two as well. 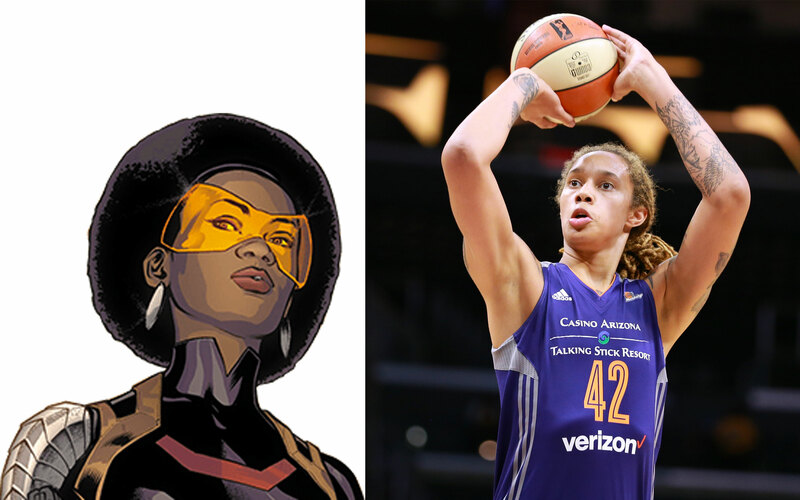 Storm commanded the X-Men after Cyclops left the group, and Moore has led teams to three high school state championships, two NCAA national championships, four WNBA championships, two Olympic gold medals and five international championships. When Luke Cage was first introduced to comic book readers in 1972, he was known as the “Hero for Hire,” only willing to save the world for the right price. From 2011-18, Howard has played for four teams, including three in the past three years, collecting millions of dollars along the way. Through the years, Howard, once the most dominant big man in the league, has been relegated to a cheesy clown with cartoonlike biceps. After the release of Netflix’s Luke Cage in 2016, the same could be said of the title character and the actor who plays him, Mike Colter. The pair are the strongest and corniest members of their respective domains. Not to mention, Cage was once recruited by a man, Cornell “Cottonmouth” Stokes, who had somewhat of an affinity for snakes, but the two immediately clashed. Sound familiar? Miles Morales, in 2011, replaced one of the most revered characters in comic book history: Peter Parker, aka Spider-Man. With the young Brooklyn, New York, native being of African-American and Puerto Rican descent, there was initially a pushback from comic book readers that Morales’ creation was merely a politically correct stunt by Marvel Comics. That, of course, is stupid, as is the ongoing debate about who is the best point guard in the NBA. Curry is the greatest shooter of all time, was the first unanimous MVP and led the Golden State Warriors to a 73-9 record in 2016. Irving has the best handles of all time, is one of the best finishers we’ve seen since Allen Iverson and made the shot over those same 73-9 Warriors to win the NBA Finals. We’re watching greatness when we watch both of them. 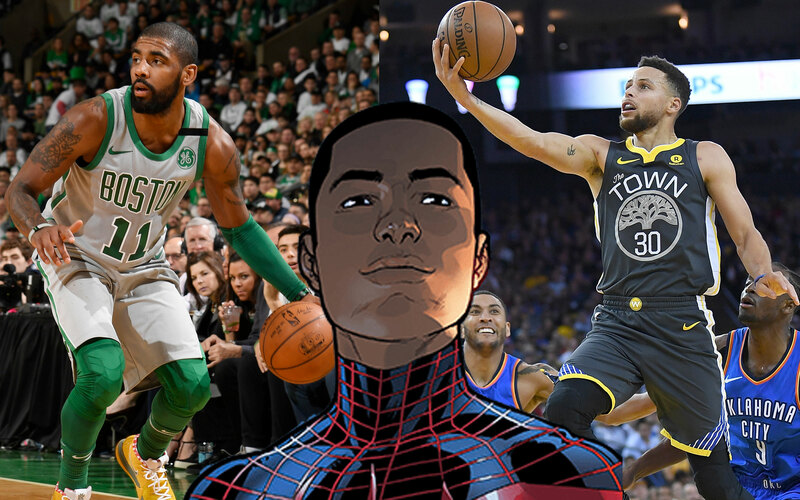 Spider-Man’s Spider-sense and insane agility best explain Irving’s crazy handles and Curry’s ironically senseless depth from behind the 3-point line. Morales has, like Black Panther, been a member of superteams: the Ultimates and Avengers. James “Rhodey” Rhodes was born and raised in Philadelphia. Embiid is the center for the Philadelphia 76ers. 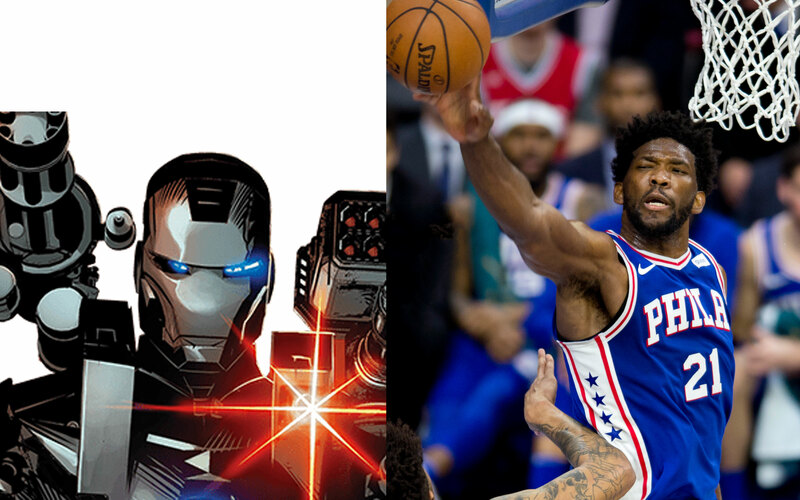 Rhodes, while in his War Machine armor, is nearly 100 percent metal, equivalent to the number of metal screws in Embiid’s body after surgeries on his knee and foot since being drafted in 2013. Like the War Machine armor, which has the weapons arsenal of a small country, Embiid is known for firing off shots at his opponents, nearly to his detriment (see: Westbrook, Russell). Antetokounmpo (an MVP candidate, if you hadn’t heard) is the future of the NBA, one day hoping to dethrone the current king, LeBron James. For now, though, the “Greek Freak” is relegated to second fiddle in the league hierarchy, much like how Wilson, aka the Falcon, is viewed next to best friend Steve Rogers. But when Rogers was once unable to fight, Wilson briefly took over as Captain America, which is what Antetokounmpo hopes to do with James (who is both Black Panther and Captain America in this exercise … keep up) in his 15th season. 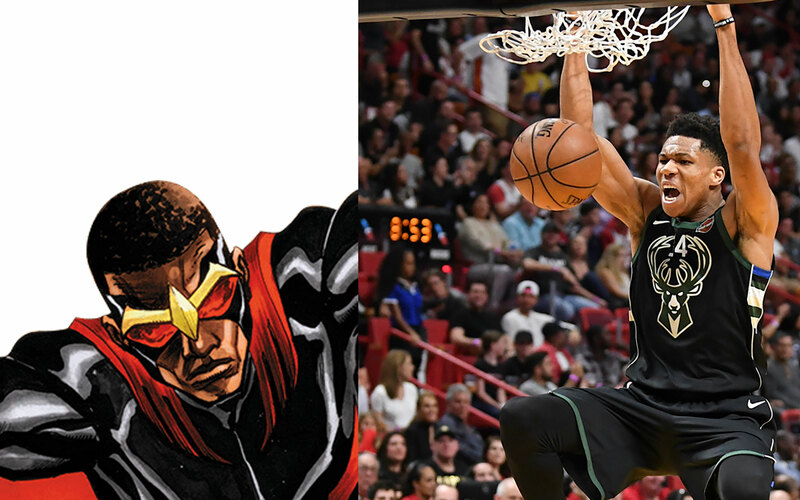 The Falcon, as his name implies, has the ability to fly, as does Antetokounmpo when he floats through the sky during his patented “gyro step” and chase-down blocks. If you don’t follow women’s basketball closely, you may have never heard of Sylvia Fowles, the Minnesota Lynx’s center. She’s just a two-time WNBA champion, two-time Finals MVP, three-time Defensive Player of the Year and last season’s MVP. Monica Rambeau, too, isn’t a household name (possibly because she’s not in a movie or television show) despite an impressive resume. She was one of the first holders of the Captain Marvel name and, at one point, was the leader of the Avengers when they battled the X-Men. She has the ability to absorb and transmit energy and fly, and she has superhuman speed. Fowles, much like Antetokounmpo, can get up the court as fast as guards despite being 6-foot-6 and soars through the air like a bird before sending opposing shots into the stands like a volleyball. The last of Rambeau’s powers is the ability to alter her appearance. Fowles is not a shape-shifter, we think, but is currently studying to alter the appearance of the deceased as a funeral director. You read that correctly. The mother of Eric Brooks, aka Blade, was bitten by a vampire while giving birth to him, passing on the traits of both humans and vampires to her unborn son. Durant, otherwise known as Durantula, is a half-human, half-spider breed capable of stretching his extended limbs to extraordinary lengths to score over and around his opponents. 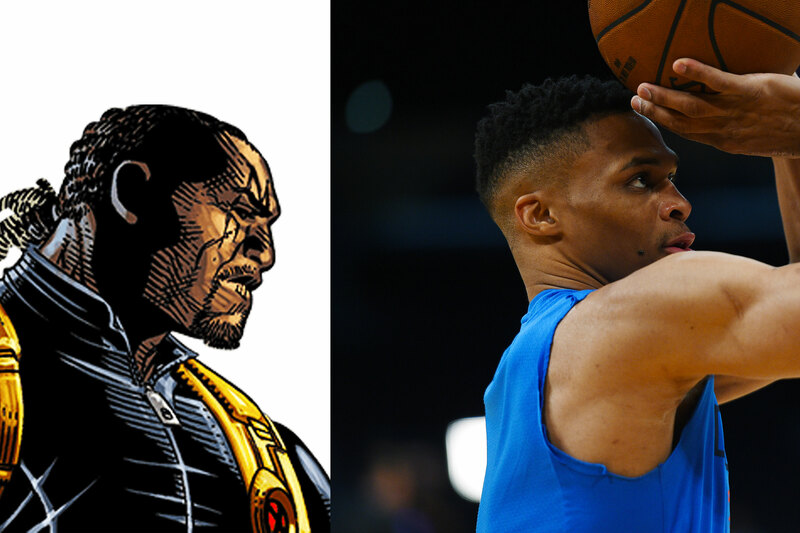 As first seen by Wesley Snipes in the trilogy of movies bearing the same name, Blade, outside of his accelerated healing and superhuman agility, rocks an Eddie Munster-bald fade-racing stripes hairstyle that is one of the worst haircuts in all of Marvel Comics. Durant’s just-hopped-out-of-bed-and-I-can’t-find-my-brush do he’s been rocking since forever is no better. At one point, Blade leaves one team, a group of vampire hunters, to join the Mighty Avengers. Where have we heard that before? Misty Knight isn’t afraid to mix it up with the boys while defending the streets of New York City. The same goes for Brittney Griner, not only one of the most feared college basketball players of all time (just ask Jordan Barncastle) but also someone whom Dallas Mavericks owner Mark Cuban considered drafting to the NBA in 2013. Knight doesn’t have actual superpowers, but she possesses a bionic right arm after losing her real one to a bomb. Griner has, by all accounts, every one of her limbs, but there’s no anthropological explanation for how she’s able to block shots at a record-setting clip. In 2014, she blocked 11 shots in one game, the most ever, and two years later recorded her 400th career swat in just her 115th game, the fastest of any other WNBA player. 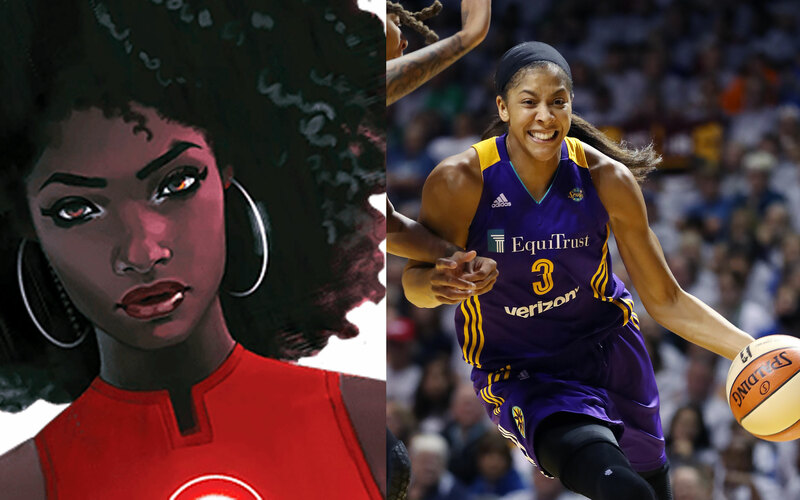 Just as Candace Parker followed in the footsteps of an icon, so, too, did Riri Williams. Former Los Angeles Sparks center and 2015 Hall of Famer Lisa Leslie passed the reins, in 2009, to Parker, one of the most dominant high school and college basketball players in history and the first and only woman to win a dunk contest. Williams, aka Ironheart, is the direct descendant of Iron Man, going from building her own suit made out of armor scraps to taking over Iron Man’s crime-fighting duties in 2016. She’s also one of the smarter characters in Marvel Comics, with her intelligence creating a distance between her and her parents. Parker, though known more for her prowess on the court, was the 2007-08 University Division I Academic All-American of the Year while at the University of Tennessee. The pair also share a regional connection: Williams is a Chicago native, while Parker grew up in Naperville, Illinois, a Chicago suburb, and rooted for the hometown Chicago Bulls. Tyrone Johnson and Kawhi Leonard win the award for having two of the blackest names in their respective arenas. Johnson, aka Cloak, has the ability to trap his enemies in a shroud of darkness known as the “Darkforce dimension,” rendering them incapacitated. This is how every NBA superstar feels when Leonard, nicknamed “The Claw,” locks in on defense. Leonard teleports across the court (another power of Cloak’s) to rip the ball from Curry or block the shot of Durant or force James into an uncharacteristic turnover. 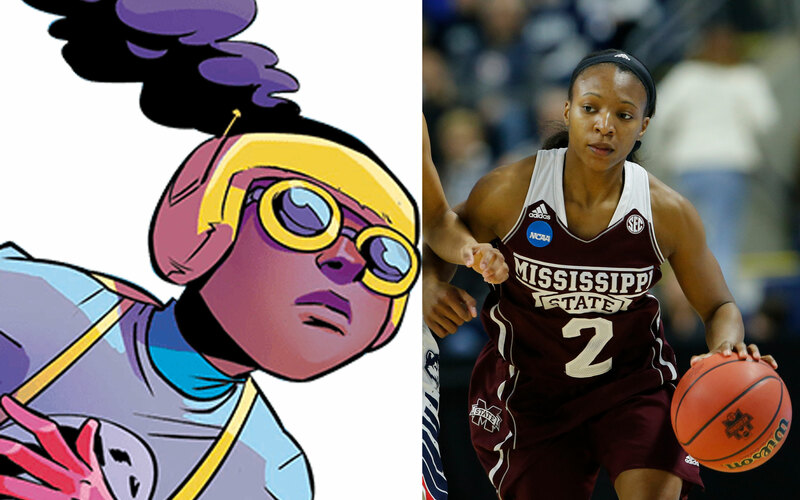 Morgan “Itty Bitty” William, a senior guard at Mississippi State, is not yet in the WNBA, but she is probably the most well-known diminutive basketball player in the country after her highly publicized exploits during last year’s NCAA tournament. Forty-one points in the Elite Eight versus Baylor. The game-winning shot versus the Incredible Hulk-like UConn Huskies, the No. 1 seed, in the Final Four. All while being the smallest player on the court: She’s listed as 5-feet-5, but she’s more like 5-feet-2. Lunella Lafayette, aka Moon Girl, was recently bestowed with the designation of smartest character in all of Marvel Comics, despite being a pint-sized (barely 4 feet tall) 9-year-old in elementary school. But where Lafayette lacks in her own size, she more than makes up for in the giant dinosaur she controls with her mind, similar to the equally small William running point for the juggernaut Bulldogs (26-o as of Feb. 12). Jericho Drumm, aka Doctor Voodoo, doesn’t have the trademark beard like Harden, but he sports a Rogue-meets-Wiz-Khalifa white patch in the middle of his hair, which is certainly just as marketable. Doctor Voodoo can use the spirit of his dead brother to either increase his own powers or inhabit the bodies of his opponents. 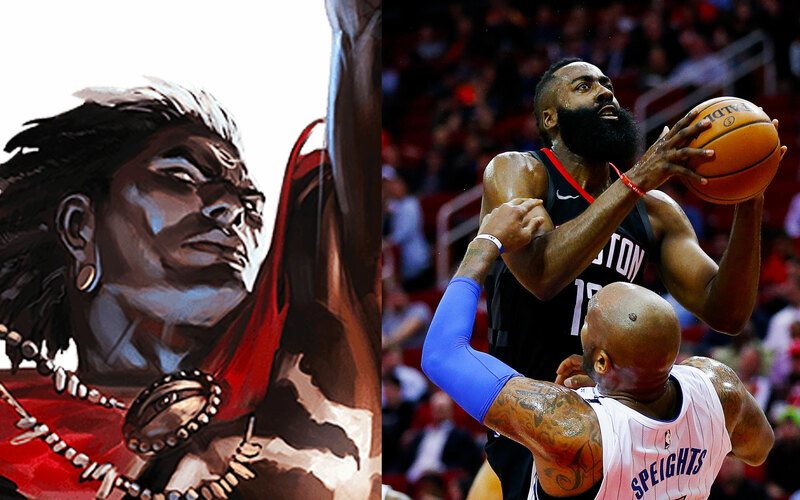 Harden, who, too, can summon spirits (what else did you think he’s cooking up on the court? ), contorts his body around the court and defenders as if he’s two people sharing a host body, which normally ends in him drawing a shooting foul. 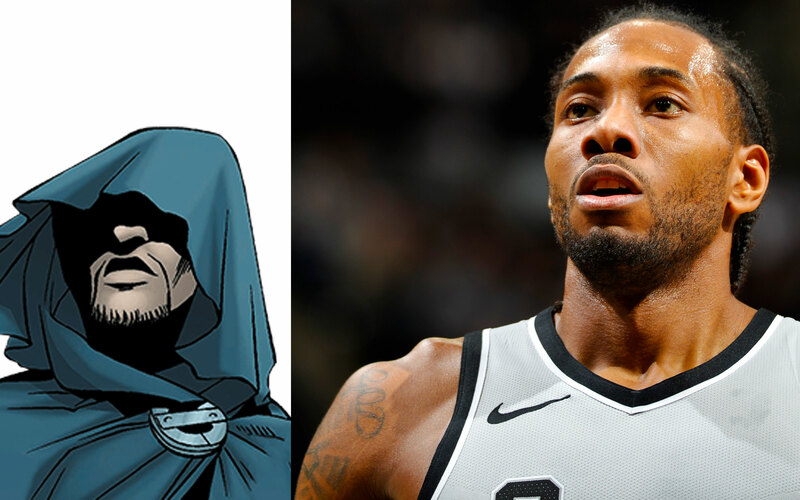 Doctor Voodoo once briefly teamed up with Blade (Kevin Durant) and assisted Black Panther on a mission, thus inflating the LeBron James-to-Houston rumors that have been popping up since Banana Boat Crew member Chris Paul was traded to the Rockets last summer. Born in a post-superteam timeline where the X-Men were all killed, Lucas Bishop was mostly a loner until joining his own (sort of) superteam in Xavier’s Security Enforcers (XSE). Bishop had to eventually kill someone he loved, his sister, to ensure his own survival after a rival group kidnapped her. 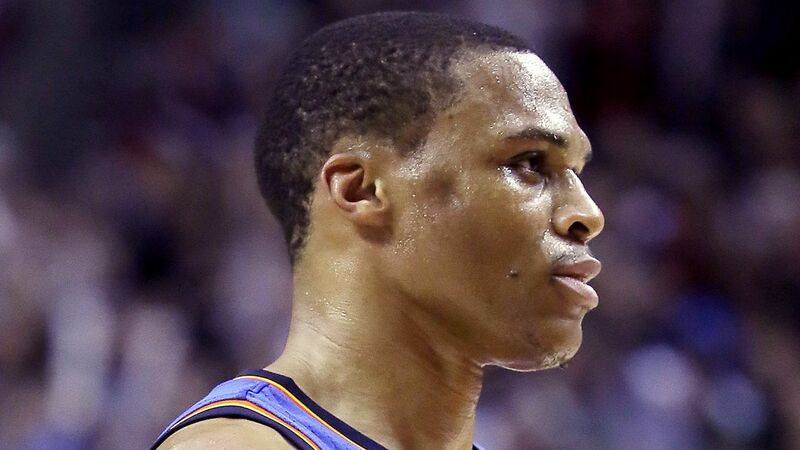 Not at all relatable to Westbrook. Bishop can absorb energy and possesses enhanced strength, speed and stamina, all characteristics of Westbrook while on a fast break. Not to mention, Bishop heals at an accelerated rate, which explains the Thunder guard’s ability to return to the court a week after having his face dented in. He had 49 points, 16 rebounds and 10 assists in that first game back, by the way. 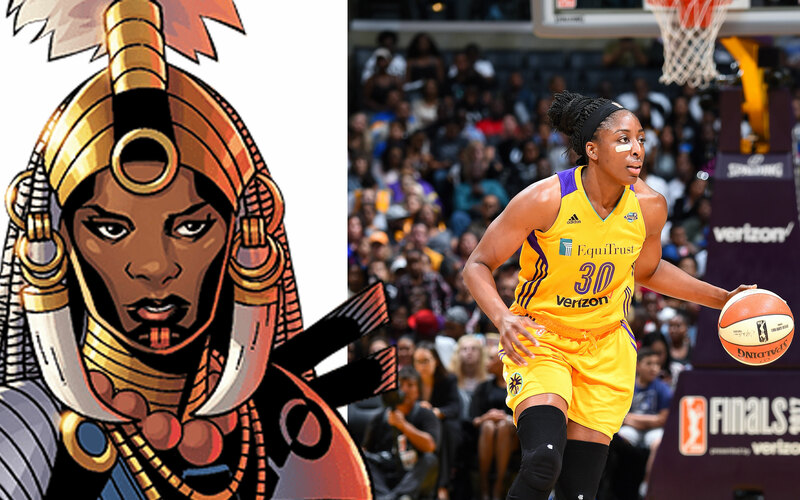 Shuri, the younger sister of T’Challa, and Nneka Ogwumike, a power forward on the Los Angeles Sparks, are both African queens (although Shuri is technically a princess), with the former hailing from Wakanda and the latter the daughter of Nigerian immigrants. Shuri is a trained warrior like her older brother and eventually succeeds him as the Black Panther, becoming the ruler of Wakanda, just as Ogwumike runs the Women’s National Basketball Players Association as its president and was the 2016 WNBA MVP. 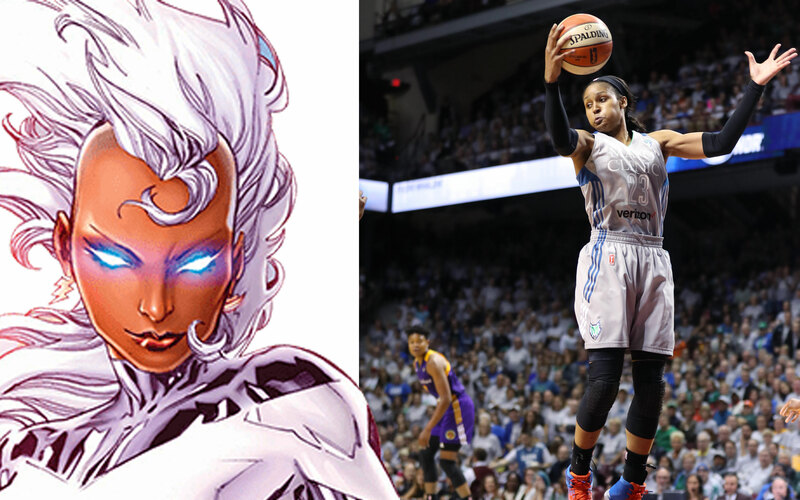 Shuri was recently given the ability to turn into stone, comparable to the impenetrable wall that Ogwumike was when she led the league in blocks in 2016. 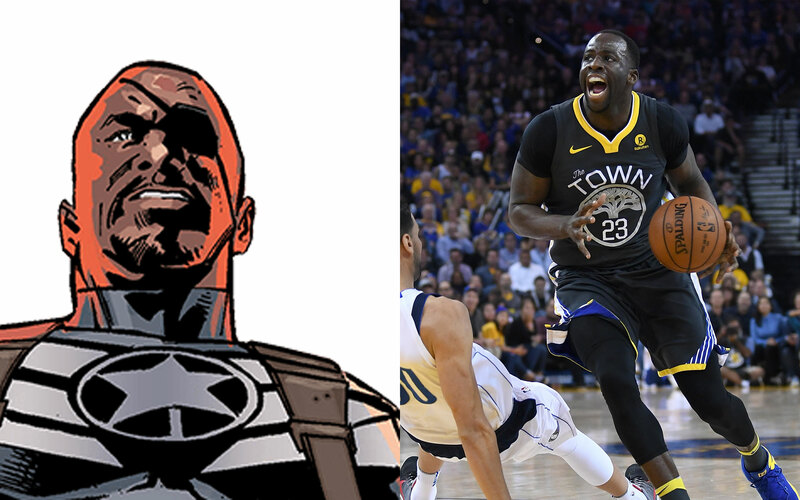 This comparison speaks more to the Samuel L. Jackson version of Fury in the Marvel Cinematic Universe, as Draymond Green is the most likely of all NBA players to yell, “M—–f—–” in a crowded space. Green, last season’s Defensive Player of the Year, may be less talented than the people around him (Fury has no superpowers), but he’s the unquestioned leader and heart and soul of his team. Who is the best Black Marvel character?